Your morning commute is trying enough without having to muscle a huge bag along with you. 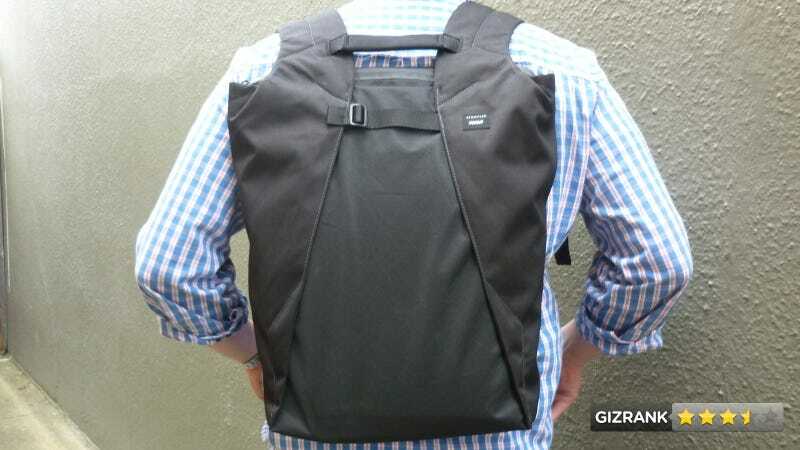 The Nhill Heist from Crumpler holds everything you need without getting in the way. A secure laptop pack that fits you like a shadow. Agile commuters, urban ninjas, corporate spooks, NASA employees, and Gizmodo employees. The shoulder straps attach to the outer edge of the bag so that, when you put it on, they fold over the main compartment's zipper to foil pick-pocketers. Put your laptop (up to 17 inches) in the padded sleeve and wear. The bag sits high and tight on your back, allowing you to move through crowds and Parkour around obstacles easily. There aren't many pockets, but this thing is like a clown car: it holds a laptop, charger brick, wireless mouse, phone, keys, wallet, and change of clothes with barely a bulge. The fold-over shoulder straps also prevent opening the smaller top pocket —so you'll need to cram all your easy-access essentials in the tiny side pocket. Did this bag just improve my posture a little? I believe it did. • Dimensions: 12.2" x 16.9" x 4.7"